The Landmarks Preservation Commission voted 8 to 3 March 10, 2009 to approve the plans for a new hospital tower to replace the Edward and Theresa O'Toole Medical Services Building on the west side of Seventh Avenue between 12th and 13th Streets as part of an ambitious expansion plan by St. Vincent's Hospital. Commissioners Roberta Brandes Gratz, Margery H. Perlmutter and Stephen F. Byrns voted against approval. The previous day a lawsuit was filed by several civic organizations and neighbors of the building to overturn the commission's 6 to 4 ruling last October that the approved the "hardship application" to demolish the distinctive structure. The commission had earlier determined that the building was important architecturally. The hospital has entered into an agreement with Rudin Management to redevelop its Greenwich Village properties and the controversial plans were substantially revised to meet some community concerns. The present plan calls for a major new hospital building on the site of the O'Toole Building and the preservation of some of the hospital's buildings on the east side of Seventh Avenue and their conversion to residential condominium apartments along with new residential condominium construction that will help finance the hospital's new tower. The new tower, which has been designed by Pei Cobb Freed, was reduced about 40 feet in height to 286 feet during the lengthy review process and the Rudin's residential plans by FXFowle were significantly altered in scale. In a statement released by the hospital after the commission's vote, Bill Rudin said that the development will now move ahead. "The Rudin family is excited to continue its work on the responsible development of the residential components of this plan," he said, adding that "The Rudin family is more committed than ever to our partnership with St. Vincent's, a partnership that will result in a dynamic new residential complex, thousands of jobs for the construction industry, and thousands of New York residents and visitors receiving the healthcare they need and deserve." Mr. Rudin said that the commission will probably look at his company's residential plans in the project as early as next month. The low-rise O'Toole building was erected in 1964 as headquarters for the National Maritime Union and its cantilevered design by Albert Ledner (see The City Review Article) incorporated scalloped edges that evoked portholes and had a glass-block base that the law suit maintained "gave it a sense of floating above the ground." The law suit noted that when the building was dedicated "it was singled out by Ada Louise Huxtable, then the architectural critic for The New York Times, for its audacity in breaking with the international style and its effort to reflect the maritime activities that it housed." The organizations who are the plaintiffs included the Historic Districts Council, the Docomomo New York-Tristate, the Historic Neighborhood Alliance, Landmark West, the Protect the Village Historic District and numerous individuals including Carol Greitzner and three nearby residential buildings. The O'Toole Building occupies the west blockfront on Seventh Avenue between 12th and 13th Streets and is just to the north of a full triangular block owned by the hospital that is used for trucking facility and used to be the site of the Loew's Sheridan movie theater (see The City Review article). According to an article by Albert Amateau in The Villager the landmarks commission "also approved St. Vincent's plan to add a second story to the one-story materials-handling building on the triangle across 12th St. from the O'Toole site." The article said that hospital executives maintained that "moving some nonclinical functions from the hospital to the second floor of the smaller building enabled St. Vincent's to reduce the height of the new hospital." :Last May, the commission ruled that the proposed 300-foot-tall hospital to replace the O'Toole Building would not be appropriate (see The City Review article). The O'Toole Building - designed by Albert Ledner and built in 1963 for the National Maritime Union - was deemed a desirable feature of the historic district and commission chairman Robert Tierney told the hospital to go back to the drawing board and also consider alternate locations. The hospital did revise its plans slightly and presented arguments against other sites and applied to the commission for a hardship waiver arguing that the demolition of the O'Toole building was necessary for the hospital carry out its mission. The new lawsuit was filed by Albert Butzel and it claimed that the commission did not follow precedents determined by the U. S. Supreme Court and also argued that when the hospital bought the building it was after the creation of the Greenwich Village Historic District and it therefore should have been aware of its landmark protections. Mr. Amateau's article said that the case "is tentatively scheduled for a court hearing on April 6." "We are thrilled that the Landmarks Preservation Commission approved St. Vincent's design for its new hospital, allowing us to take another step toward providing 21st-century, state-of-the-art healthcare for all of Manhattan's West Side," said Henry Amoroso, St. Vincent's chief executive officer. Mr. Amateau's article also noted that "The Seventh Ave. subway station entrance, originally planned for inside the hospital property line, will be outside the building because it requires an elevator that could not fit within the property." 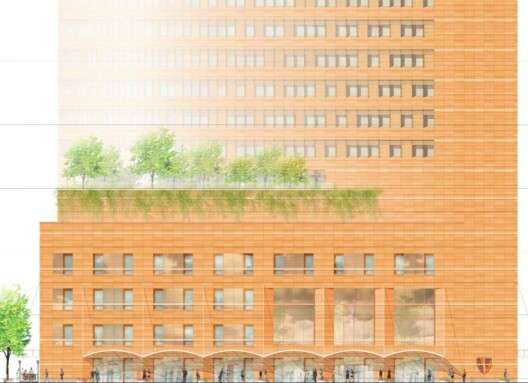 The approved design of the new tower indicates that itg will be curved on both sides and also have orange/beige facades that are unlike the red-brick facades of most of the hospital's existing buildings on the east side of Seventh Avenue. In the new design, the Seventh Avenue base of the new tower has been redesigned and now has a marquee with six curved sections, a gesture perhaps to the scalloped edges of the former National Maritime Union Building that it will replace. The modified new design still is ungainly. While it is likely that its detailing will be nice and that its "elliptical" plan might make good sense given the current state of medical/hospital technology, this building is not a masterpiece that will make old architecture buffs forget the delightful eccentricities of Albert Ledner's building and its nautical motifs floating above glass-block columns nor the hospital's unforgiveable replacement of Greenwich Village's only movie palace with a loading dock for its trucks. The better solution would have been to insert a tower into the shell of Ledner's building a la Norman Foster's Hearst Building uptown and to have shifted some space onto the triangular block to the south occupied by the loading dock. The preservationists' claim that the new building was and is too tall is not very convincing. Would they demolish the Jefferson Market Court House Clocktower because it is too tall. Where were they when so many white-brick monstrosities were being strewn about? A medium size skyscraper if properly designed can be a thing of beauty and also of context but context is not a golden, absolute rule. The commission, of course, must still rule on the Rudin residential plan and unfortunately the preservationists were successful in their campaign to have the commission negotiate major changes. The original plan was very handsome and the epitome of careful, contextual planning. What we're now left with is a mish-mash of some not very glorious red-brick institutional buildings being converted to residential with a mix of some modest new residential construction. The Rudins are to be applauded for perserving through all this mess and for doing their best to help an historic institution better serve our wonderful but troubled city. St. Vincent's can never be forgiven its previous destruction of truly nice older buildings on its site but there is no question that it serves a very important role in the city. Balancing importantly institutional needs and community interests and good architecture is obviously not easy and sometimes major sacrifices must be made. 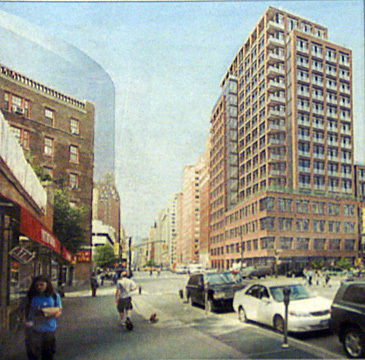 On June 9, 2009, the commission was presented with a revised plan for the main Rudin residential tower on Seventh Avenue. Its height was now reduced to 218 feet and the commission indicated it was likely to approve it. 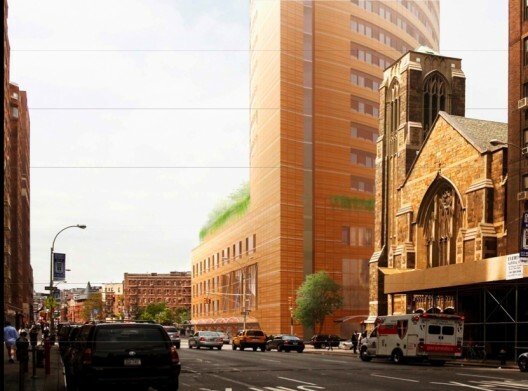 St. Vincent's Hospital's expansion plan in Greenwich Village was finally approved yesterday by the Landmarks Preservation Commission in July 2009 by a vote of 9 to 1 after it reduced the height of the largest new residential building in the complex by 15 feet to 203 feet. Originally, it had proposed a 266-foot-high residential condominium building that would have filled the east blockfront on Seventh Avenue between 11th and 12th Streets. After negotiations lasting more than a year and a half with the community board and the landmarks commission, the hospital agreed to retain several existing buildings including one on the southeast corner of Seventh Avenue and 12th Street. Earlier this year, the landmarks commission approved a "hardship" application from the hospital to demolish the Edward and Theresa O'Toole Medical Services Building designed by Albert Ledner in 1964 for the National Maritime Union on the northwest corner of Seventh Avenue and 12th Street. The commission previously had denied permission to demolish it and had declared it historically important. The hospital initially planned to replace it with a 329-foot-high new hospital building so that its existing complex across the avenue could be developed residentially by the Rudin family. 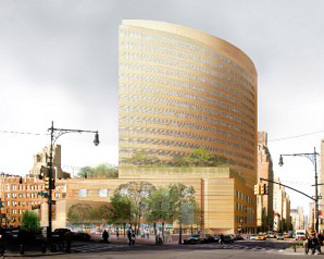 The commission and many community groups including the Greenwich Village Society for Historic Preservation felt that the proposed new hospital tower, a curved designed by Pei Cobb Freed & Partners, was too tall and its height was reduced to 286 feet. Dan Kaplan of FXFowle Architects is the designer of the complex's residential plans for the Rudin organization that initially offered about $300 million to the hospital for the rights to develop its properties east of Seventh Avenue. Construction of the residential portion of the project will not proceed until after the hospital moves into its new building. The entire project still needs the approval of the City Planning Commission and the City Council and in March some civic groups filed suit against the Landmarks Commission claiming that it failed to follow "hardship" guidelines established in two famous preservation cases, one involving Grand Central Terminal and the other St. Bartholomew's Episcopal Church on Park Avenue. The distinctive O'Toole building was noted for its nautical motifs and it had been purchased by the hospital in 1977. The hospital also acquired separately the former site of the Loew's Sheridan movie theater that had occupied the triangular block bounding by Seventh Avenue, Greenwich Avenue and 12th Street and which has been used by the hospital only as a loading dock. This part of the Greenwich Village Historic District is also faced with new construction in the immediate area as the Metropolitan Transit Authority plans to put a ventilation facility on the triangular vacant lot on the southeast corner of Seventh Avenue and Greenwich Avenue that for many years was occupied by a gas station and a White Tower restaurant that served scrumptious, but small cheeseburgers with diced onions, sliced pickles and catsup for under a dollar. An article by Albert Amateau in the last week's edition of The Villager reported that on June 22 the MTA presented the local Community Board with several plans for the site, which is currently surrounded by a wire fence festooned with ceramic tile plaques commemorating the tragedy of the terrorist attacks on the World Trade Center of September 11, 2001. The article indicated that a spokesperson for the MTA indicated it was willing to incorporate some of the "Tiles for America" in its project.